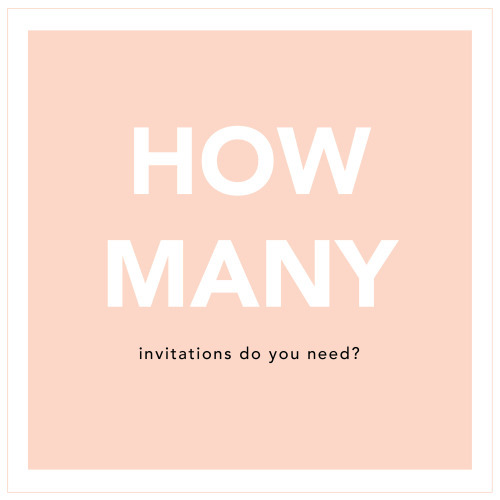 One and Only Paper — How many invitations do you need? It’s time to embark on step two of your stationery journey - calculating how many invitations you need to order! The number of suites you need can affect your price significantly, and you don’t want to under order, as reprints are costly. A great rule of thumb for estimating is that you need roughly 60% of the number of guests you have, but that can be confusing for some people, so I’m going to break it down today! Pull up your guest list. Now, look at the number of households or addresses you are sending invitations to, not the number of people. This is important! If Jane and John Smith are married and living together, they’re not each going to receive a separate invitation. And it’s likely that the majority of your guest list is couples or families. 1 to send to your photographer. And that’s it! If you are still working on your guest list, you can click here to access my handy template for inputting your addresses - at the bottom it will automatically calculate how many you need!